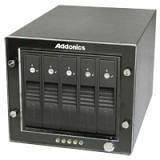 The RAID Tower III is a compact RAID storage system that include many features come in larger RAID Towers. As many as five 3.5" SATA hard drives can be installed into the RAID Tower III. The small foot print, silent operating and large storage capability of the RAID Tower III make it the ideal solution for a wide variety of storage applications in small businesses and homes.